I like big bulbs and I cannot lie. 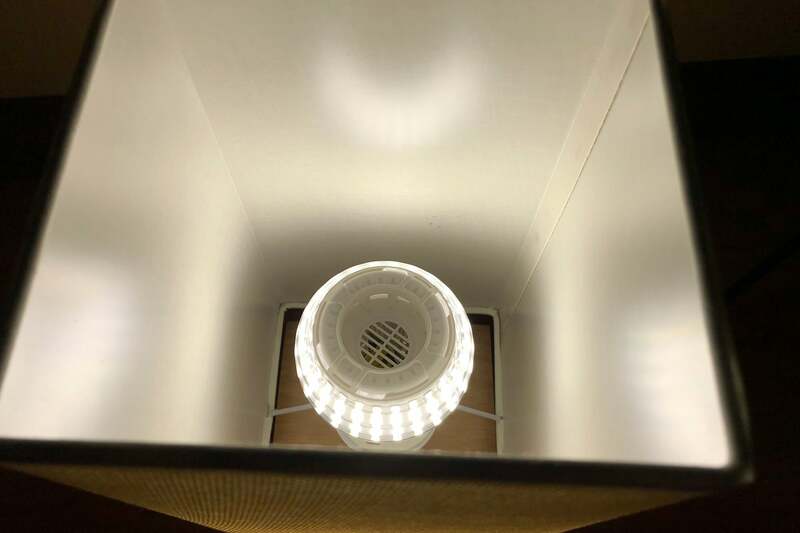 Due to the physical placement of LEDs within the bulb and the design of their electronics and heat sink, many LED lights are built with an unfortunate hang-up that causes light to shine primarily in one direction: away from the socket (i.e., straight up when installed in the typical lamp, or straight down when installed in a pendant). Is this what Thomas Edison had in mind? Absolutely not! SANSI proposes a solution in the form of its Omni-directional Bulb, a unique, unconventional, and exceptionally rotund lighting option that is designed to spread light more democratically. Individual LEDs are clearly distinguishable when the bulb is turned on. I obviously can’t compare longevity directly, but SANSI does rate this bulb at 25,000 hours, which is in line with or longer than most bulbs on the market. SANSI offers this bulb in three different wattages (17W, 23W, and 27W), tuned to either 3,000K (soft, warm light) or 5,000K (a much colder daylight tone). The bulbs are also available in dimmable and non-dimmable versions. 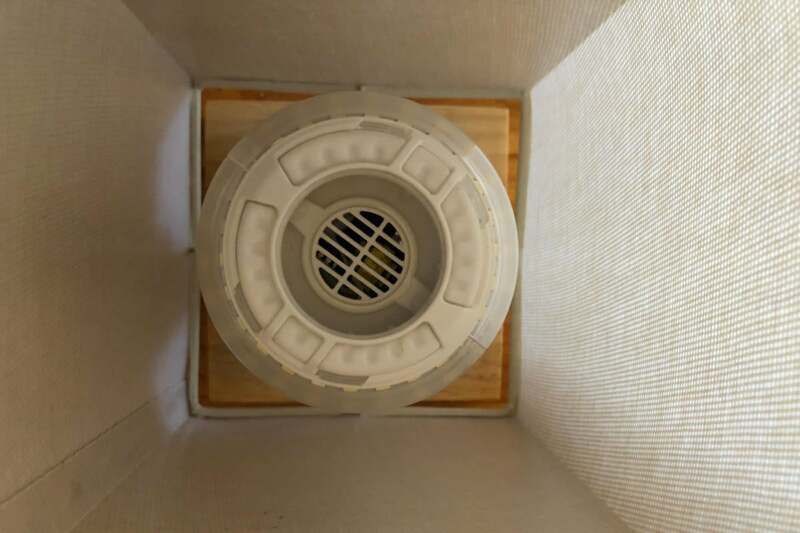 The company sent us the 27-watt, 5,000K, non-dimmable version for testing. The difference between this bulb and a standard LED bulb is staggering on every dimension. First, consider the size. The SANSI bulb is about 9.5 inches in circumference around its widest point, while the Philips LED bulb pictured is 7.5 inches around. The weight difference is even more unfathomable: 7.9 ounces for the SANSI, vs. 2.3 ounces for the Philips. Your lamp will need to bring its A game to support such a bulb. 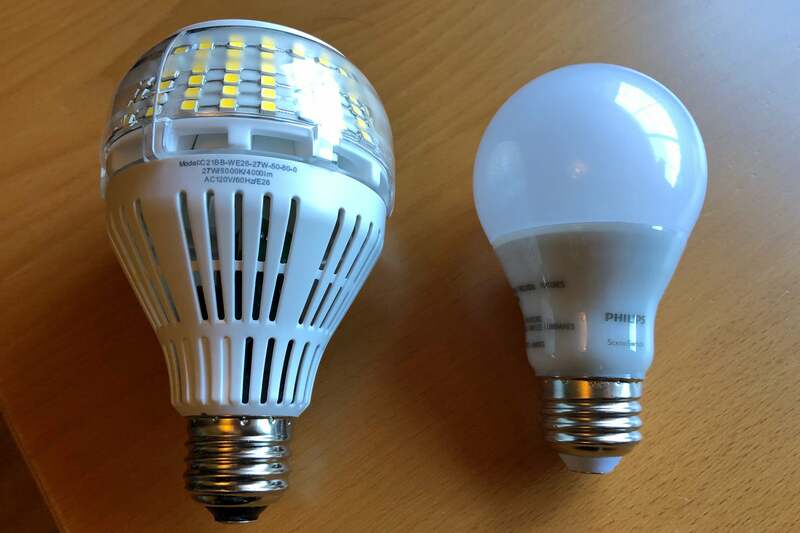 The SANSI bulb dwarfs a typical LED bulb (a 60-watt-equivalent Philips in this case) in every dimension. There are, of course, tradeoffs to be had, mainly in the form of a much brighter lighting experience. That Philips bulb puts out just 800 lumens on a draw of 9.5 watts. 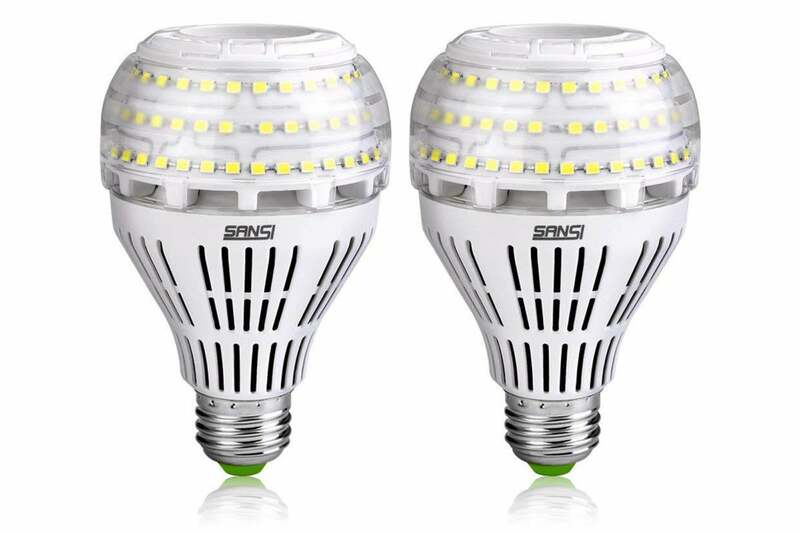 With almost triple that power draw, the SANSI is rated at 4,000 lumens: The equivalent of a 250-watt incandescent bulb. The bulb is indeed extremely bright: It is painful to look directly at, unless you are looking at it from above, where the bulb is hollowed out, a bit like a donut. As for whether the light is any more uniform than a typical LED bulb, it’s difficult to say. It’s so much brighter that everything seems more illuminated, regardless of the where the bulb is actually directing the light. That said, the placement of the LEDs doesn’t seem particularly “omni-directional” as none of them are aimed downward and, as noted, none are aimed directly upward, either. Since there’s no frosted glass covering the LEDs, you can even make out the individual diodes if you look closely, not that I recommend doing so. That pincushion effect doesn’t really denote a smooth, continuous lighting experience, either. A sinkhole design leaves the top of the bulb lightless by design. If you’re using this bulb with a lampshade, a frosted globe, or some other means of diffusion, you probably won’t notice any of that: The bulb’s inherent, massive brightness will simply overpower any concerns you might have about whether the lighting is even or not. At a street price of about $25 per bulb ($49.99 for a two-pack on Amazon), these bulbs run a significant premium over generic LEDs (about $5) and name-brand bulbs (up to $10), though you’ll be hard pressed to find anything as bright. But while these bulbs aren’t suitable for using as task or accent lighting—they’re just too bright, and the reviewed bulb isn’t even dimmable—there are plenty of applications where they are: Namely, anywhere you need a ton of light pouring out of a single socket. If that’s the case, cutting out the 220 or more watts of energy draw that a similar incandescent would require makes this bulb a no-brainer. Need a low-power light that’s five times brighter than a typical LED? SANSI’s got you covered.